In conjunction with International Polar Bear Day, today Frontiers North Adventures is proud to announce its collaboration with Polar Bears International to help bring Google’s Street View to Churchill, Manitoba’s wild polar bears. 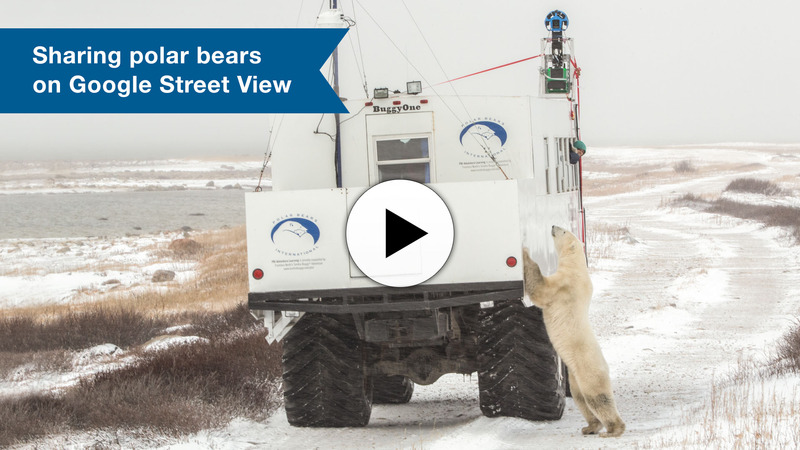 Using Google’s mapping tools, people from around the globe can now explore the habitat of one of the world’s best-known polar bear subpopulations, all captured using a Google Street View Trekker mounted on a Frontiers North Adventures Tundra Buggy®. During October 2013 Frontiers North Adventures hosted the Google Maps team in Manitoba Conservation’s Churchill Wildlife Management Area and, with leadership from Polar Bears International, retained the Google Maps Trekker to capture imagery during November at Cape Churchill in Parks Canada’s Wapusk National Park. Both areas are near Churchill, Manitoba and home to world’s most dense annual polar bear aggregations. As the premier tour operator in Canada’s subarctic, Frontiers North Adventures is the perfect partner for the project. Frontiers North Adventures has worked closely with Polar Bears International for more than a decade, helping to bring attention to the plight of the majestic animals as they face disappearing sea ice caused by climate change. Together, they helped Google by guiding the Street View Trekker team, capturing over 40 kilometres of interactive panoramic photographs. View Frontiers North Adventure's behind-the-scenes video of mapping the realm of polar bears.